Sanford, Florida lies on the I-4 corridor between Orlando and Daytona Beach. 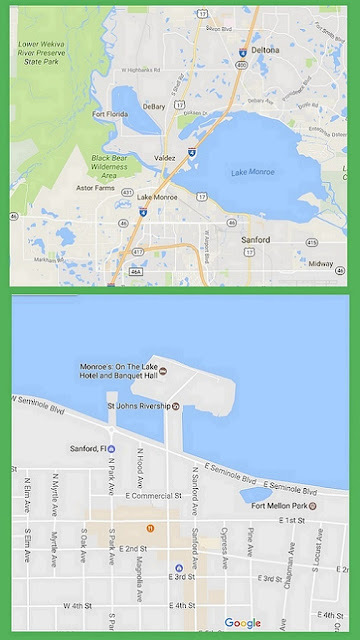 Sanford occupies the southern shore of Lake Monroe. Lake Monroe is a major body of water on the St Johns River. 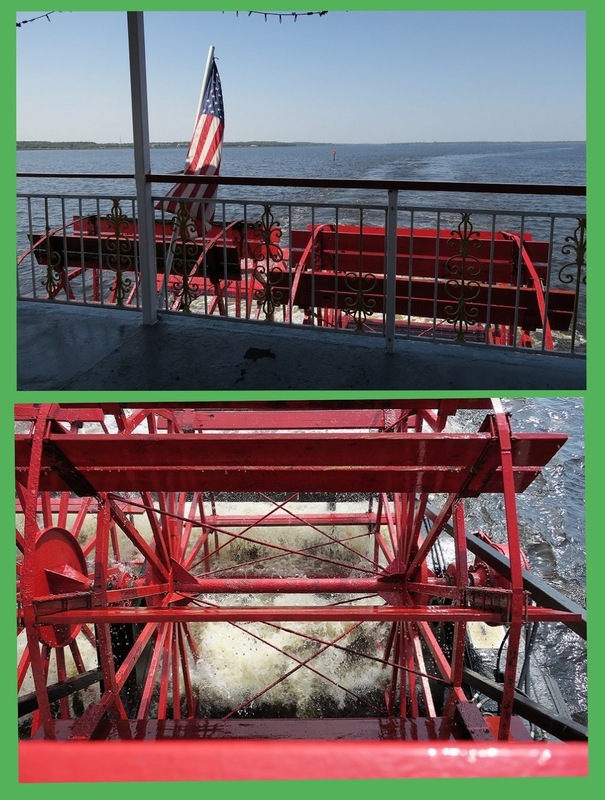 Today we enjoyed a lunch cruise on Lake Monroe in the paddle-wheel riverboat "Barbara-Lee." 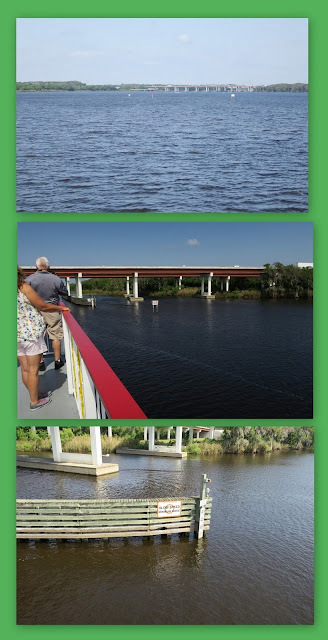 One of Michelle's social clubs (The Mad Hatters) sponsors day trips to interesting locations in central Florida and today was the event for March. Sunny and cool with a stiff breeze was our weather today. 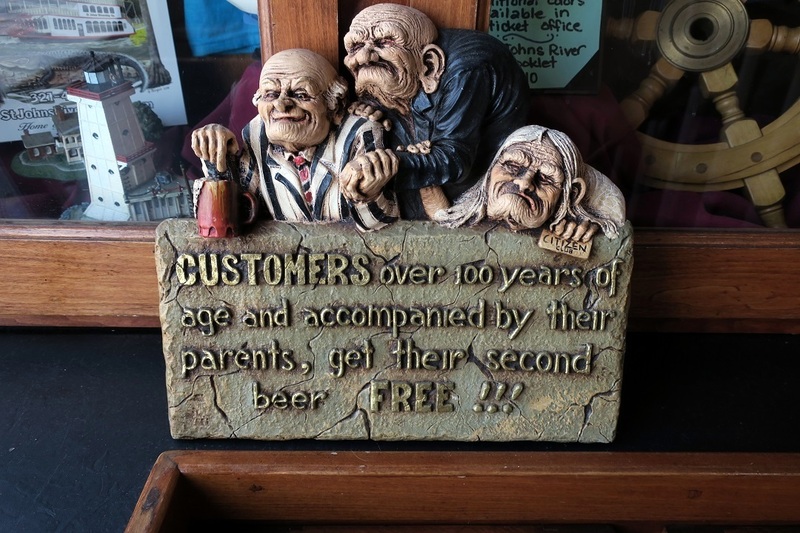 Perfect for a riverboat cruise. Intended as a day of sociability, I had two other goals for my day. First was to get some material to kick this blog back to life. Not traveling for over a year has caused 'Follow The Cougar' to languish. Michelle, I, and the Cougar have all spent too much time in the sick bay. With our summer 2017 'Great River Road' trip approaching, it's time to reclaim my little corner of cyberspace and breathe life back into this blog. 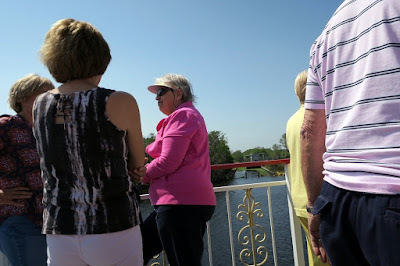 What better source of material than a riverboat cruise? Second, again motivated by our planned 2017 summer adventure, I recently purchased a new camera. Today would be a good practice session. Reluctant to get back into photography, I have been using the camera on my smartphone for the past few years. Postprocessing those pictures for use in my blog, magazine articles, and short stories, revealed many shortcomings. So I bit the bullet and bought a Canon Powershot G9X. Now I have to learn to use it. The User Manual is 261 pages. Camera technology certainly has changed. The picture possibilities are awesome, but the learning curve is steep. 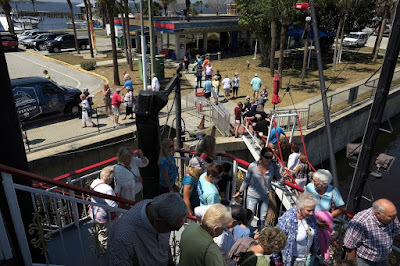 The Barbara-Lee is a paddle-wheel riverboat berthed at the foot of Palmetto Ave in Sanford, FL. 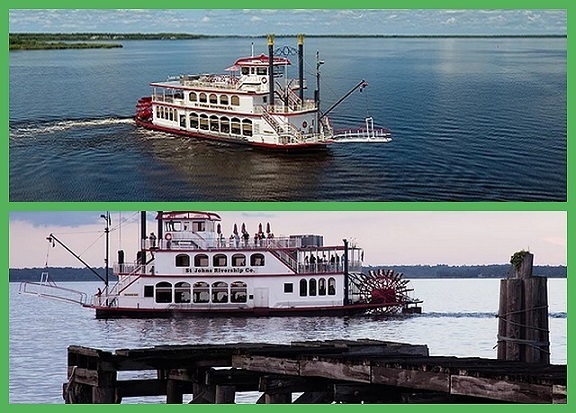 It belongs to St. Johns Rivership Co., a family owned business providing lunch, dinner, and evening cruises on Lake Monroe. The paddle-wheel is real, not just for show, and actually drives the boat. After boarding and getting situated, we went through the obligatory life jacket drill. No lifeboats, however. If this boat sinks, the instructions are to get out and walk. The Barbara-Lee draws three feet of water, and Lake Monroe is five feet deep. We couldn't even tell if the boat sank. Our cruise was a lunch cruise, but it started with a snack. 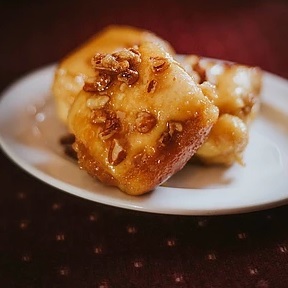 I guess it was supposed to be 'Brunch' and Barbara- Lee is famous for her sticky buns. The reputation is well-deserved. 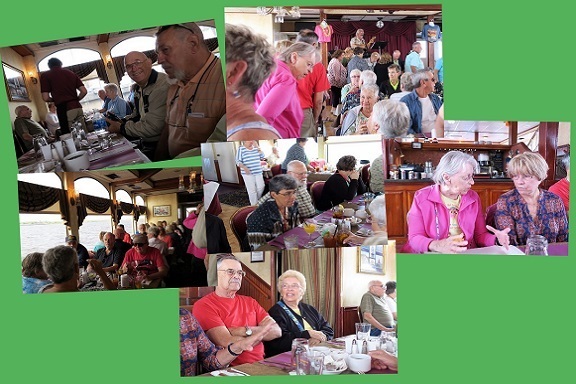 Before and during Brunch was social time. 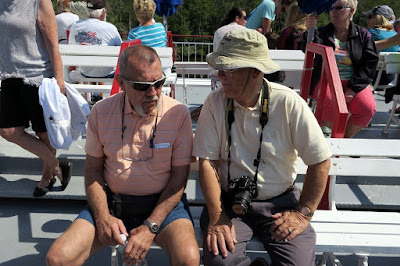 Then they hustled us out onto the deck so they could set up for lunch. Just in time to witness our passing under Interstate Route 4. Everyone enjoyed the fresh air and sunshine. 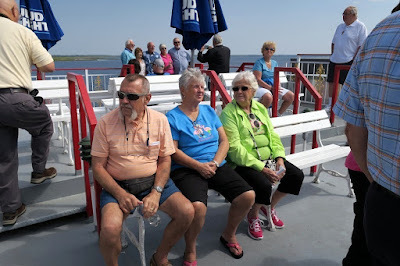 Time to enjoy fresh air, sociability, and picture taking. When they called us in for lunch, I noticed this little trinket which I'm sure is intended for the raucus crowd on the dinner cruise, not for a sedate group like us. I don't know how they can afford to sponsor such a good deal. I didn't take pictures during lunch. First, because I didn't want to interrupt my eating, and second I didn't think it polite to show all our friends stuffing their faces. So I'll just show you the menu and let you imagine the aromas and tastes that we enjoyed. During lunch, we turned around and headed home. Downstream and downwind made this part of the trip much faster, but we did have time for more sightseeing from the top deck. 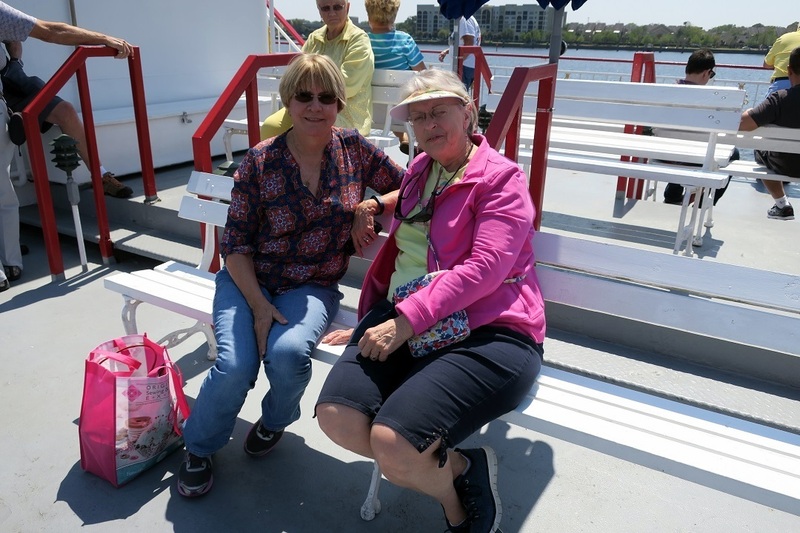 I have been on many boats – different sizes in different waters. I am always impressed with the skill shown by a captain when parking a boat. He/she has a very high and hard curb to work against, usually wind to contend with, and maybe a current or tide complicating his life. In this case, the boat was propelled by a paddle-wheel, not a propeller, making steering in close quarters nigh impossible. He successfully executed without breaking a sweat. Well done, Captain. Thank you for an enjoyable afternoon. We'll have to do this again sometime.